Our home is back together after the December decorating frenzy. I love having our house more cozy starting the New Year. I showed you my Winter Wreath HERE. a look at the guest room. (you know my favorite room). room to read or rest for a hour before I start dinner. I bring my tea cup and saucer and my newest favorite book. As you know my husband and I are retired. alone to reflect, read or dream for an hour a day. I moved the bed and added a new comforter and shams. thrift store. The little flowers in the tea cup are beautiful. The blue lace handkerchief was my mothers. I can't remember where I found the blue and yellow tea cozy. While I was taking the photos I was dreaming of painting this room. It needs to painted and new carpet installed. I might get to this room sometime this fall. and my little lamb from Williamsburg, Virginia. The comforter and shams I found at the thrift shop for $12.00 dollars. the comforter at the bottom of the bed? My romantic guest room in the afternoon. I found the 'Lenten Rose' blooms and two daffodils in the garden. standing in a wet and soggy flower bed. Your guests room looks lovely and ready for company! I think it looks sort of French Country but I guess I'm hardly an expert on that! Very pretty. OMG! Your guest room is so pretty! Having such a lovely and comfy room, your guests may outstay their welcome! LOL! Very pretty!! Love your tea pot cozy! Thanks so much for stopping by!! I can see why you enjoy finding your space in this guest room. It is so inviting. I'm like you, I like my space away from that area where my husband & I share time together, and where his BIG chair is. The colors and decor you've chosen are restful. Blue and white is one of my favorite combinations and your bed is so pretty in it. I think I like it best with the comforter at the end of the bed. Your tea cozy and teacup really compliment each other. So cozy and charming. I like the comforter at the foot of the bed, as well. Everything is so beautiful and I love the stories with each piece. Your new teacup is exquisite, but the best deal was on the bedding. I'm in love with it! What a beautiful room, Betty! I can see why you enjoy going there every afternoon. Your thrifted teacup is soooo pretty...sigh! What a treasure that was to find. Your grandma's mirrored sconce is another lovely addition to your sweet guest room. Blue and white is my favorite color combo, so I love your colors. The Shelley teacup is one of their most valuable at the moment, so a great find. Thanks for linking to Tuesday Cuppa Tea. What a sweet, beautiful and truly lovely room! My favorite colors! Betty, I love the color scheme of white and blue and yellow. It's nice to have a space for reflection and quiet. Thanks for sharing. Sylvia D.
I can't blame you one bit for spending time in that lovely and serene room. You have created such a wonderful space there. 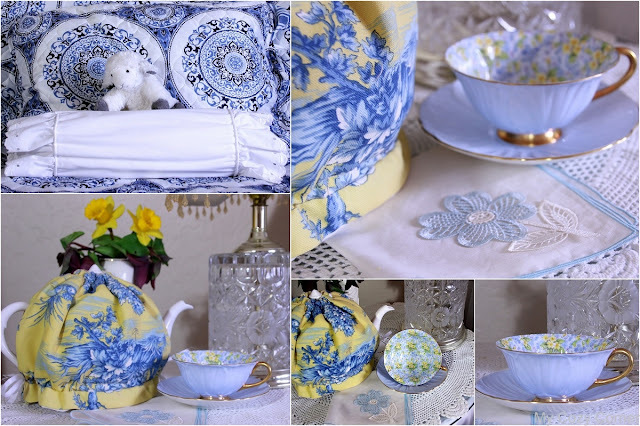 I applaud you for finding such gorgeous bedware and a SHELLEY teacup for so cheap - WOW - that's treasure right there to be sure. Betty, your guest room is lovely! The tea cozy is gorgeous and the teacup is perfect! One cannot go wrong with a Shelley and yours is really pretty. I like your comforter at the foot of the bed. Blue, white and yellow compliment each other so well and I understand perfectly why you would retreat to this room. It's very serene. Thank you for sharing at No Place Like Home. Love that you use your pretty guest room for some daily R & R! Purple is my favourite colour so I'm loving your beautiful Shelley teacup! You have a beautiful home Betty! May I borrow the wise aforism on the right side-bar? Your guestroom is a very pretty place for a cup of tea and a quiet hour. I love your comforter and sham - and prefer it in the first photos. Blue and white - my favourite combination! I can see why it's your fav room. Very pretty and cozy indeed. I am not a tea drinker, but a huge quilt lover. Yours is gorgeous.Do not recall seeing that pattern. It is a beautiful place to retire to each afternoon! I love how you've decorated it and the tea cup is so beautiful!! Happy Pink Saturday! What a lovely room and perfect for your get-away as well as an overnight guest.